This story follows the journey of four gay boys in a Texas Baptist Church who search for love and acceptance in the church and clubs of Dallas, while desperately trying to deal with the pain and rage of growing up gay in the South. 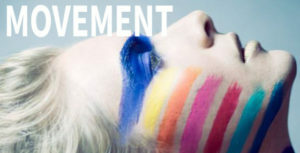 MOVEMENT, an Original Devised Performance Piece on Gay History and the Gay Rights Movement. Directed & Choreographed by Jenna Tamisiea Elser, co-founder of Glow Lyric Theatre and head of Converse Opera. February 11, 2018 @ 3 p.m. Winner of 2012 NYC International Fringe Festival! It’s 1956 and the Susan B. Anthony Society for the Sisters of Gertrude Stein are having their annual quiche breakfast. Will they be able to keep their cool when Communists threaten their idyllic town? 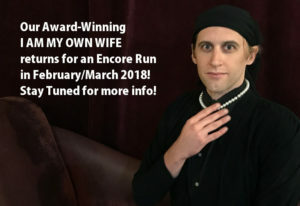 Winner of the 2004 Pulitzer Prize and Tony Award, “I Am My Own Wife” is based on a true story, and inspired by interviews conducted by the playwright. Our debut show stars Upstate actor Dave LaPage (recently in “Death and the Maiden” and “Am I Dead?” at Centre Stage and “Important Hats of the Twentieth Century” at The Warehouse Theatre) in 30 different roles in this fascinating tale of Charlotte von Mahlsdorf, a real-life German Transwoman (a self-described transvestite) who managed to survive both the Nazis and the East German Communist regime, as well as operate a museum and an underground gay and lesbian support group. 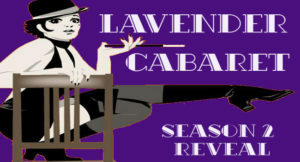 This program is funded in part by Chapman Cultural Center, its donors, the County and City of Spartanburg and the South Carolina Arts Commission which receives support from the National Endowment for the Arts and the John and Susan Bennett Memorial Arts Fund of the Coastal Community Foundation of SC.